Classic festival wristband available with smooth satin or woven fabric options. Fitted with a flat black barrel lock as standard. The flat barrel lock works with any of our woven fabric wristbands. 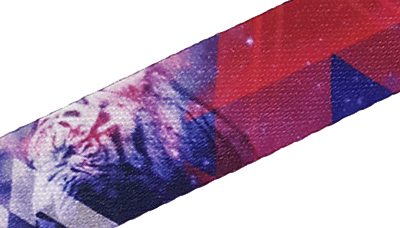 It features a one-way sliding lock that uses prongs to pierce the fabric, preventing the wristband from being removed. The Barrel lock wristband and our other fabric wristbands have additional security features available including barcoding, serialisation and UV weaves. Good reliable service. The online order page was simple to use.Wristbands were of excellent quality and the delivery service was swift. This is the second time I have dealt with id&c and once again i'm happy with the service they provided. We got these for our wedding as we wanted a festival theme. The bands looked amazing, exactly like one you'd get at Glastonbury. Can't recommend highly enough.